Over the past 40 years, the Muskoka Autumn Studio Tour has seen a continued evolution, presenting only the finest professional artists and craftspeople working within Muskoka. There is always something new to discover, from well-designed functional items to expressive fine art. Everything you see on the tour has emerged from the inspiration of the landscape and the skill of our members. The artists of Canada's original studio tour invite you to explore Muskoka's dramatic autumn landscape and to see where the past year's inspiration has taken us. The remarkable realm of colour, form, texture, and design created by the artists of the Muskoka Autumn Studio Tour is echoed in the splendour of the region at this magnificent time of year. The brilliant foliage and sparkling waters highlight the pleasure of seeking out the studios tucked in back roads and overlooking scenic vistas. The Muskoka Autumn Studio Tour began its artistic journey in the late seventies, when sculptor Richard Green, joined by a few friends, first developed the innovative concept. Dedicated to the belief that a piece of art is best understood when the viewer can meet the creator, the original members of the Muskoka Autumn Studio Tour enthusiastically opened their studio doors and shared not only their finished work, but also the processes behind it. Through discussion, demonstrations and displays, visitors to the Muskoka Autumn Studio Tour were able to deepen their understanding and appreciation for a multitude of artistic mediums and techniques. Born of the creative vision of one artist over four decades ago, the Muskoka Autumn Studio Tour has grown to become a highly respected event, attracting new and returning visitors every fall. Close to one hundred artists have participated and tens of thousands of people have been welcomed into their studios. 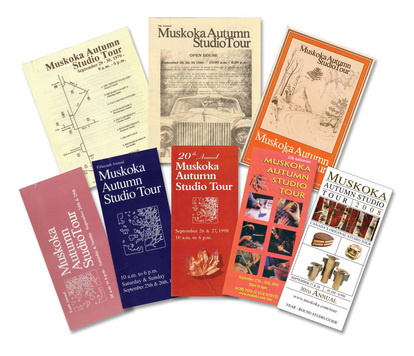 The concept of studio art tours has spread to other regions, but none have been so thoroughly dedicated to the founder’s determination that the visitors have the opportunity to be educated in the artistic process.The rich legacy it has established will nurture the future artists of Muskoka for decades to come. If you are an established, professional artist with a studio in Muskoka and would like to find out more about becoming a member of the Tour, please visit our Application page. In celebration of the Tour's 35th anniversary, the artists compiled a collection of brochures for each year during the past three decades of excellence. They offer a fascinating glimpse into the evolution of this annual event.